Pat Taylor, Exhibiting Member in Fiber, has been using her creativity to create quilted bears to donate to the Winston-Salem Police Department. This began with a customer donating a much loved quilt that was beyond repair. That quilt is now Angel Bears that will be given to first responders to have available for children who are in frightening situations or worse. The bears will give them a friend to hug during a difficult time. Piedmont Craftsmen is partnering with the Winston-Salem Police Department to help Pat expand this program further into the community. You can help with donations of cotton fabric scraps, cotton batting (stronger batting like Warm and Natural), sewing thread and poly fiber fill stuffing for the bears. If you have something to donate, please email Pat at taylorfiberart@yahoo.com. 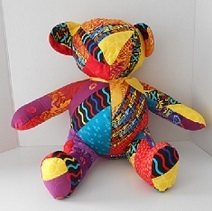 If you don't have any of that stuff, but want to help, monetary donations can be made to Piedmont Craftsmen, Inc. ( Memo - Project: Buddy Bears). We plan to expand bear making with various community groups. Also contact Pat if you are interested in helping with the group efforts.